One of the most astounding characteristics of the large-scale universe is the very large number of beautiful spiral galaxies. Most of the larger galaxies in the local universe are spiral galaxies. Why is that fact surprising? It's surprising because of what is called the winding problem. Galaxies rotate, and a galaxy like ours takes about 200 million years to rotate. But consider a rotating spiral galaxy. The stars closer to the center of the galaxy will take a much shorter time to rotate around the center of the galaxy than the stars closer to the edge of the galaxy (just as planets close to the sun have much shorter years than planets far away from the sun). That's because the circles of rotation of stars closer to the galaxy's center have a much smaller radius. Therefore, based purely on rotation speeds, we should expect that the spiral arms of a spiral galaxy should “wind up” after only 2 or 3 rotations, and that spiral arms should last less than a billion years. But the age of the universe is about 13 billion years, and spiral galaxies are believed to be about that age, or almost as old. This means the average spiral galaxy has undergone more than 50 rotations. Based on simple rotation considerations, it seems that we should not at all be seeing even a tenth of the spiral galaxies that we see in the sky. But don't worry, scientists have an explanation to cover this: what is called the density wave theory. But it's not a particularly credible explanation. 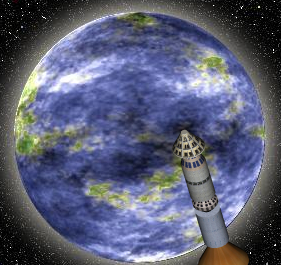 It doesn't seem to stand up very well to observations, and it isn't well-confirmed by computer simulations. Explanations of the density wave theory often use an analogy involving traffic patterns. We are told that just as we can explain concentrations of cars near freeway exits, we can explain the concentration of stars in the spiral arms of spiral galaxies. But anyone familiar with the distance between stars should be suspicious with this analogy. Cars on a freeway exit are relatively close to another. But stars are not relatively close to each other. The distance to the nearest star is 6 million times the diameter of our sun. So how can any type of freeway exit car concentration analogy be appropriate for stars so far apart? The “density wave” imagined by the density wave theory is merely an area where stars are about 10% more common. But given the immense relative distance between stars, how can anything that far apart act like a wave? 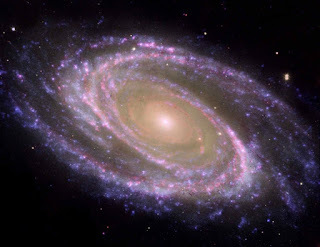 A recent scientific paper studied the spiral galaxy M81. The paper concluded, “Our data therefore provide no convincing evidence for a stationary density wave with a single pattern speed in M81, and instead favor the scenario of kinematic spiral patterns that are likely driven by tidal interactions with the companion galaxies M82 and NGC 3077.” The “tidal interactions” theory is a completely different one from the density wave theory, and one with its own plausibility problems (tidal interactions are random gravity tugs that we should not expect to produce all that often the orderliness of spiral arms). An offset is expected between these subsamples as a function of radius if the pattern speed of the spiral arm were constant - as predicted by classic density wave theory. No significant offsets are found....The standard scenario of density wave theory with a constant pattern speed results in an offset with respect to age for the distribution of distances to the spiral arms as one moves from the central regions... No significant differences are found in the distribution of these sources, giving further negative evidence for density wave spirals. The paper has a visual showing some simulated galaxies that resulted from the simulation, although we have no idea whether the authors cherry-picked those galaxies that most looked like spirals out of some large batch of simulated galaxies. But even the shown simulated galaxies don't actually have clear spiral arms (except for one). We see instead disks seeming to consist of random blobs of matter surrounding a dense core. From the fact that the paper makes no mention of “spiral” or “spiral arms,” we can conclude that no notable success was achieved in frequently creating simulated galaxies with spiral arms like the spiral arms in spiral galaxies (if such a success had been achieved, I can't see how the authors would not have mentioned it). Here we have another case of scientists trying to explain a mountainous effect (that a large fraction of the universe's galaxies are magnificent spirals) by using a little molehill of an explanation (that it's just "traffic jams" that cause this). I suspect something vastly deeper is going on. Postscript: The recent discovery of "super spirals" ten times bigger than our galaxy makes it all the much harder to explain spiral galaxies, as discussed here. “Dangerous Numbers” or Providential Parameters?